Small Metal Bins can be inter-stacked and are designed to carry any weight that can fit within the area of the bins. Racking mouth of metal bins are designed to fit into racks and create easy accesses to pick up the items. Metal Bins has a solid front. Drop handles on the end to make these metal, stackable boxes are perfect for moving materials at workplace. 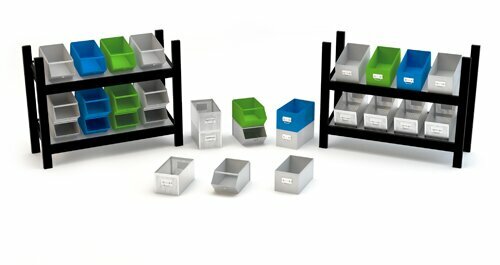 Metal bins are ideal storage systems for small parts and finished goods storage. It can also be easily remove for replenishing or replacement. Metal bins can be rearrange by unstacking the racks with bins and reassembling as per desire as well as Interlocking racks provide stable support for this system. Bins bottom base are to place bins at more ergonomic position for access. Sturdy and robust steel sheets with reinforcement are joined into row sections which enable the stable stacking system to secure level stacking. Rigid and Robust construction for long life. Weather resistant and free of bugs and other pests. Two and four way entry for forklift and hand truck.